MITROVICA, Kosovo – Kosovo Albanians on Sunday blocked roads and burned tires on a planned route by Serbia's president in the former Serbian province, further fueling tensions between the two Balkan foes. During his two-day trip, President Aleksandar Vucic planned to visit a Serb-populated village in central Kosovo on Sunday, but roads leading to the region were blocked by wooden logs, trucks and heavy machinery. 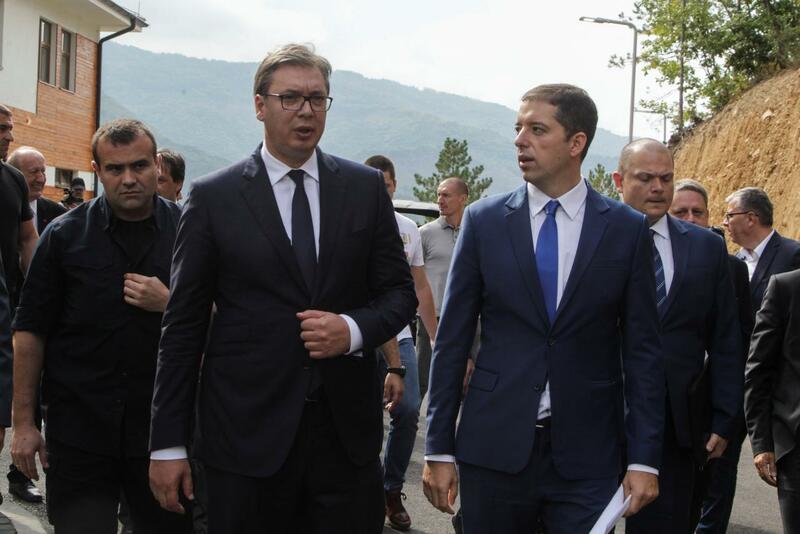 Vucic and his entourage were later stopped by Kosovo police on the road to the Drenica region and were told they couldn't continue for security reasons. Kosovo Prime Minister Ramush Haradinaj wrote on his Facebook page that he has "cancelled the permission issued by the Foreign Affairs Ministry for Serb President's visit to the Drenica zone." "Citizens' security is above all," he wrote. Serbian media said gunfire could also be heard, but those reports couldn't be independently verified. Vucic wasn't under attack. "I have never been fascinated by someone's hatred. But when someone is so mean, showing some symbols that they believe we get offended by, well they are very mistaken," said Vucic, a former ultranationalist. "Now, I am even more determined to preserve peace, but also to preserve Serb institutions and Serb people" in Kosovo. Serbian Interior Minister Nebojsa Stefanovic blamed the blockades on former Kosovo Liberation Army soldiers who fought Serb troops in Kosovo during the 1998-99 war for independence. The conflict ended with NATO intervention, which forced Serbia to pull out of Kosovo. Kosovo unilaterally declared independence in 2008 which Serbia doesn't recognize. Stefanovic said that security in Kosovo has deteriorated and that gunshots have been reported to Vucic's security guards, "which is a signal that Serbs are not welcome." Stefanovic said that NATO-led KFOR troops and Kosovo police are being tested to provide safe passage for Vucic. Serbia and Kosovo must mend ties to advance toward European Union membership. The two sides have been engaged in EU-mediated negotiations.